Try your hand at two of Dubai’s most daredevil activities—topped off by a camel ride—on this scenic desert adventure. 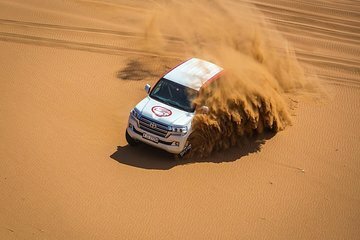 Get special access to remote terrains in a sturdy, 4WD Land Cruiser, including front-door pickup from your hotel. Then, hit the sand at full-speed as you go dune bashing, followed by sand boarding. Tours also include a tasty BBQ dinner in a Bedouin camp, plus live entertainment.